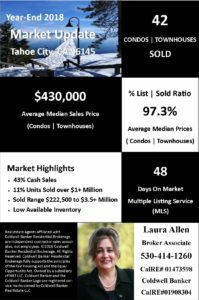 Looking for sold year-end 2018 real estate data for the condo \ townhouse market in the North Lake Tahoe – Truckee area? Here is the year-end 2018 review for the region. The North Lake Tahoe – Truckee real estate market conditions continue to improve and favor Sellers. You can see that the over-all North Lake Tahoe – Truckee condo/townhome price trend is moving up, which means lower priced condos are harder to find than they were a few years ago. You will see on the graph below that the North Lake Tahoe – Truckee regional condo/townhome prices are up +7.02% for 2018 when compared to the previous year. Condos/townhouses closed a median average sales price of $449,500 (MLS Areas 1-9). Important Reader Note: As an FYI, past North Lake Tahoe – Truckee real estate market reports that I have produced have been for “All MLS Areas”, this report has been fine-tuned and only covers the MLS Areas 1-9 (immediate North Lake Tahoe – Truckee area), so if you are looking at older reports and comparing numbers you will notice that the numbers are different, and this change in reporting data is why they are not the same. 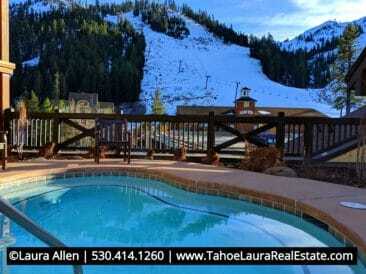 the sold average median sales price in the North Lake Tahoe – Truckee area (MLS Areas 1-9). In every day terms this means Sellers are still getting close to their full asking price, and Buyers that want to low-ball properties are not being very successful. Historically, our available condos/townhomes for sale inventory levels are at their highest levels during our summer months. It isn’t uncommon to see seasonally low levels at the beginning of the year. The exception to this over-all decline in inventory is an increase in the number of condos and homes for sale located directly around our popular ski resort areas! These winter locations are now in their prime selling season during our coldest months and we often see these areas with their best selection of properties! For the entire area we continue to have extremely low condo/townhouse inventory levels, despite the time of year, and that will help to continue to keep prices up for Sellers. Here are the condos/townhouses for sale in the North Lake Tahoe area, all price points starting with the lowest price first. Days on Market (DOM) as they continues to drop. For 2018 the number of days on the market for condo/townhouse is now at 99 days down slightly from 102 DOM in 2017, but is down 15.4% from the 117 DOM in 2016. The shorter the marketing time for a condo/townhouse, the stronger the market is for Sellers. Inventory – Inventory levels are down from the July home levels for the North Lake Tahoe-Truckee region. Again, another sign of the market favoring Sellers. Over-all transactions dropped by over 19.5% in 2018 over 2017 levels. 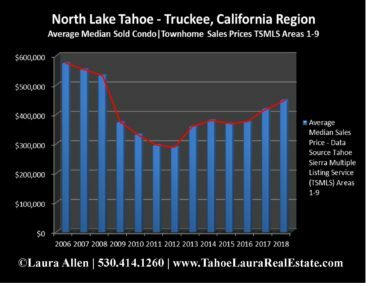 Do you want more long-term North Lake Tahoe – Truckee real estate data? Check out the following table that has a lot of data going back over ten years. Both the average median sales price and average sales price (in some cases there is a significant difference between the two, but the market trends are the same direction for both) are included for each year. REO’s = Real Estate Owned, which is the name banks use for their bank foreclosed properties.Short Sales = Owner does not have the money to pay off all of the debt and asks the debt holders to take less back in order to close the sale. Year-to-date summaries are based on information from the Tahoe Sierra Board of Realtors (TSMLS). Due to TSMLS reporting methods and allowable reporting policy, this data is only informational and may not be completely accurate. Therefore, Laura Allen, or Coldwell Banker Residential Brokerage does not guarantee the data’s accuracy. Data maintained by the TSMLS’s may not reflect all real estate activity in the market. All information is deemed to be reliable, but is subject to change, modification, and/or correction without prior notice. If your property is currently listed for sale, or you have an active Buyer Representation Agreement, this is not intended as a solicitation. 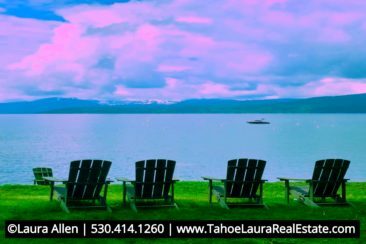 Other items of interest: Currently we have some of the most impressive North Lake Tahoe – Truckee luxury condos and townhomes on the market. The demand for our luxury mountain condos and townhomes in the North Lake Tahoe – Truckee area continues to be very strong. Want to review older regional condo/townhouse market reports? Want to know what happened in the single family market for the region?